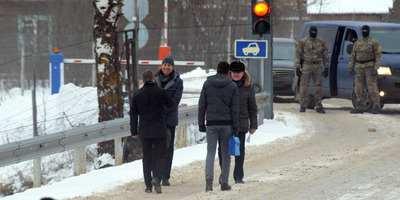 Estonian Internal Security Service (KAPO) via Associated PressEstonian Raivo Susi, second left, and Russian Artern Zintsenko, second right, are seen during a prisoner exchange, at the Koidula border in southeastern Estonia, on February 10, 2018. Over the weekend, Russia and Estonia exchanged two men convicted of spying in each country. Estonia and other Baltic countries have warned that Russian intelligence activity directed against them is increasing. Tensions between Russia and other NATO countries has been elevated for some time. The Baltic News Service said this weekend that Estonia and Russia exchanged two men convicted of espionage at a border crossing between the two countries. The region’s main news agency cited Estonia’s Internal Security Service as saying that Raivo Susi, an Estonian found guilty of espionage and sentenced to 12 years in a high-security prison in Russia, had been exchanged Saturday for Artern Zintsenko, who had been given five years by Estonia for spying for Russia in May. The two men were allowed to return home after receiving presidential pardons. “Estonia extradited to Russia a spy who committed a crime here and the Estonian entrepreneur was able to return to his loved ones after a long retention in Russia,” Estonia’s security agency said, according to the Associated Press. Zintsenko was arrested by Estonian Internal Security Service on January 9, 2016. According to Estonia’s state prosecutor, Zintsenko was recruited in 2009 and started spying in the Batlic country in 2013, focusing on gathering intelligence about the country’s military and critical infrastructure. Zintsenko had no military experience, but his father and grandfather were in the Soviet military and his great-grandfather worked for Soviet counterintelligence during World War II. A senior official with Estonia’s Internal Security Service told Buzzfeed that Russian intelligence capitalised on Zintsenko’s affection for his great-grandfather, manipulating his family ties and stoking a “romantic feeling” about being a spy. Zintsenko’s grandparents settled in Estonia in 1966. While he lived with his parents in Russia, he did visit his grandparents frequently, spending summers there, according to Buzzfeed. Susi, the Estonian businessman freed in the exchange, was arrested in Moscow on February 10, 2016. Buzzfeed reports that he was involved in several aviation companies and was on his way to a country in Central Asia when he was arrested. There was no immediate confirmation from Moscow. Zintsenko’s case is not an isolated one for Estonia. He was the 10th convicted spy in nine years and the first of them to have been recruited by Russia’s military intelligence service, known as the GRU. Euronews/Estonian Security PoliceEstonian Raivo Susi, second left, and Russian Artern Zintsenko, second right, embrace their counterparts during a prisoner exchange in southeastern Estonia, February 10, 2018. Estonia’s internal-security service said in its 2017 annual report that Russia – acting through the GRU and its Federal Security Service, the FSB – had taken special interest in the foreign and security policies, defence planning, armed forces, arms development, and military capabilities of its neighbours. “Considering the security situation, such incidents can be expected to recur,” the report said. The Baltic country’s first spying case since regaining independence in 1991 came to light in September 2008, when a former high-ranking defence official was arrested and jailed for passing NATO secrets to Moscow. In 2016, Estonia caught and convicted two dual Russian-Estonian citizens for spying on military and law-enforcement activity for the FSB. Two other people recruited by the FSB were caught in 2015.